LITECOIN Continue To Lead The Crypto ChargesteemCreated with Sketch. 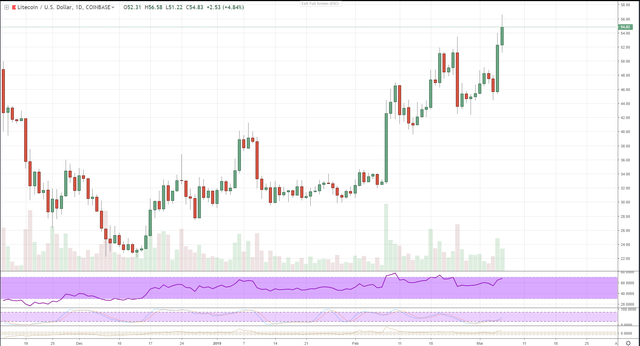 We've seen great volume and follow through here with the bulls on Litecoin. There's still speculation that developments and changes with this coin have caused a lot of excitement leading to such a rally. In either case, Litecoin is basically the most bullish looking coin in the top markets currently. We're seeing higher lows and higher highs to take the move higher after basically three months of bull action so far. Whether or not this continues to sustain is speculation, but so far, signs are looking good. Technicals are still favoring bulls. The 4-hr chart is overbought currently, and the daily is heading that way. Stochastic RSI is bullish as well, so things are seeing great for the bulls! Hope you're all doing great and hope the rest of the markets follow suit with LTC!